Kenya: One week after Garissa attack Jump to media player Kenya's government tries to restore public confidence in its security forces, one week after Islamist al-Shabab militants attacked Garissa University, killing nearly 150 people. Outrage in Nairobi over bank freeze Jump to media player Kenyan authorities have suspended the licences of 13 money transfer firms believed to be involved in funding al-Shabab. Kenyans 'shocked and angry' Jump to media player Hundreds of students take part in a march in Nairobi to remember those killed in last week's attack at Garissa University. 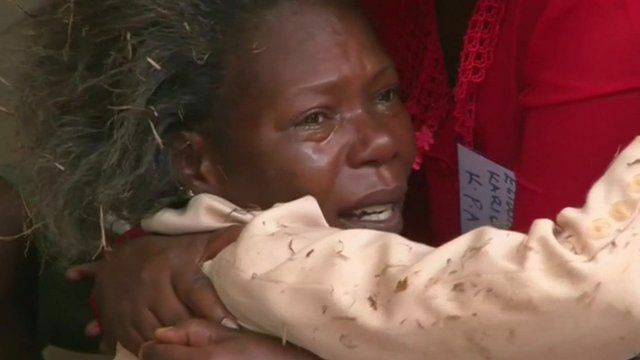 'I found my son's name in the mortuary' Jump to media player The BBC's Emmanuel Igunza reports from Nairobi in Kenya on the anguish and anger of relatives trying to trace their loved ones following the al-Shabab killings which left 148 people dead at Garissa University last week. Kenya grieves for Garissa victims Jump to media player Kenyans have gathered at a church service in Nairobi to remember the 148 victims of an attack on students at Garissa University. Garissa gunman named by Kenya Jump to media player Kenyan authorities say they have identified one of the militants who attacked Garissa University, killing 148 people. Student 'hid in cupboard for two days' Jump to media player A young Kenyan student has described how she drank body lotion because she was so thirsty while she hid from al-Shabab attackers for two days. The government in Kenya is trying to restore public confidence in its security forces - one week after nearly 150 people were killed by Islamist Militants at a college in the north of the country. Amid criticism that it could have done more to prevent the attack, the authorities have suspended the accounts of scores of individuals and companies suspected of having links with the Somali militant group al-Shabab. Milton Nkosi reports from Nairobi.